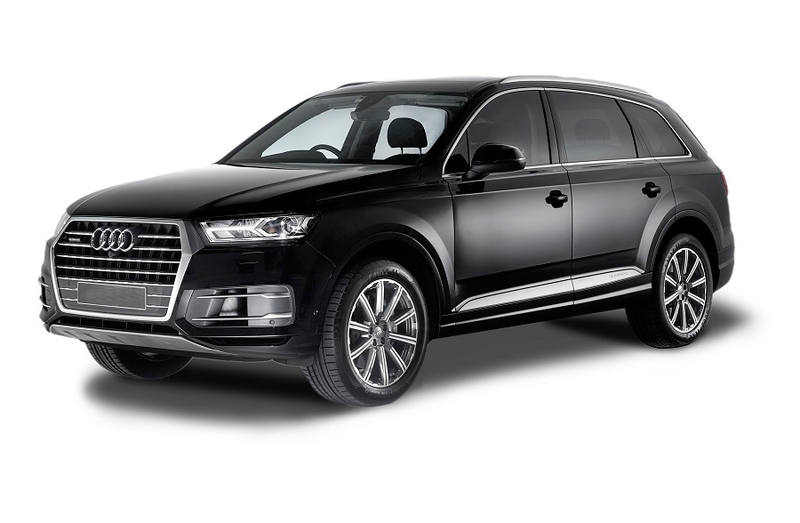 If you’re looking for a vehicle that can hold up to six passengers in addition to your chauffeur, you’ll love the Audi Q7 hire car. This luxury vehicle seats one passenger in the front with the chauffeur and up to five in the rear, and offers plenty of leg room and cargo space. It offers space for 4 large pieces of luggage with 4 passengers. The intelligent design matches luxury with comfort and is sure to impress you and your passengers. It offers one of the best driving experiences in its class thanks to its lightweight construction and unrivaled agility on the road, allowing it to handle any drive with ease. Not to mention, it gets great fuel efficiency. Everyone along for the ride will enjoy the spacious interior which offers room to stretch and relax, even on longer journeys. The generous luggage compartment means all of your bags are in one place. The liftgate is designed with efficiency in mind and is extremely easy to load and unload cargo. When you select an Audi Q7 hire car as your vehicle hire, you’ll never have to worry about its condition. Our chauffeur service ensures that all vehicles are maintained to a high-quality standard and that everything is spotless for your journey. All you have to worry about is enjoying the ride. Let our Audi chauffeurs get you from A to B on your next trip with our premium Audi Q7 hire car services today.